Systemic inhibition of the inflammatory enzyme cyclooxygenase (COX) 2 decreasesthe risk of breast cancer and its recurrence. However, the biology of COX-2 in themulticellular tumor microenvironment is poorly defined. Mammary tumor onset and multiplicity were examined in ErbB2 transgenic mice thatwere deficient in mammary epithelial cell COX-2 (COX-2MECKO) comparedto wild type (WT) mice. Tumors were analyzed, by real time PCR, immune-staining and flow cytometry, forproliferation, apoptosis, angiogenesis and immune microenvironment. LentiviralshRNA delivery was used to knock down (KD) COX-2 in ErbB2-transformed mouse breastcancer cells (COX-2KD), and growth as orthotopic tumors was examined in syngenicrecipient mice, with or without depletion of CD8+ immune cells. Mammary tumor onset was delayed, and multiplicity halved, in COX-2MECKOmice compared to WT. COX-2MECKO tumors showed decreased expression ofKi67, a proliferation marker, as well as reduced VEGFA, its receptor VEGFR2,endothelial NOS and the vascular endothelial marker CD31, indicating reduced tumorvascularization. COX-2MECKO tumors contained more CD4+ Thelper (Th) cells and CD8+ cytotoxic immune cells (CTL)consistent with increased immune surveillance. The ratio of Th markersTbet (Th1) to GATA3 (Th2) was higher, and levels of Retnla,a M2 macrophage marker, lower, in COX-2MECKO tumor infiltratingleukocytes compared to WT, suggesting a prevalence of pro-immune Th1over immune suppressive Th2 lymphocytes, and reduced macrophagepolarization to the immune suppressive M2 phenotype. Enhanced immune surveillancein COX-2MECKO tumors was coincident with increased intratumoral CXCL9,a T cell chemoattractant, and decreased expression of T lymphocyte co-inhibitoryreceptors CTLA4 and PD-1, as well as PD-L1, the ligand for PD-1. 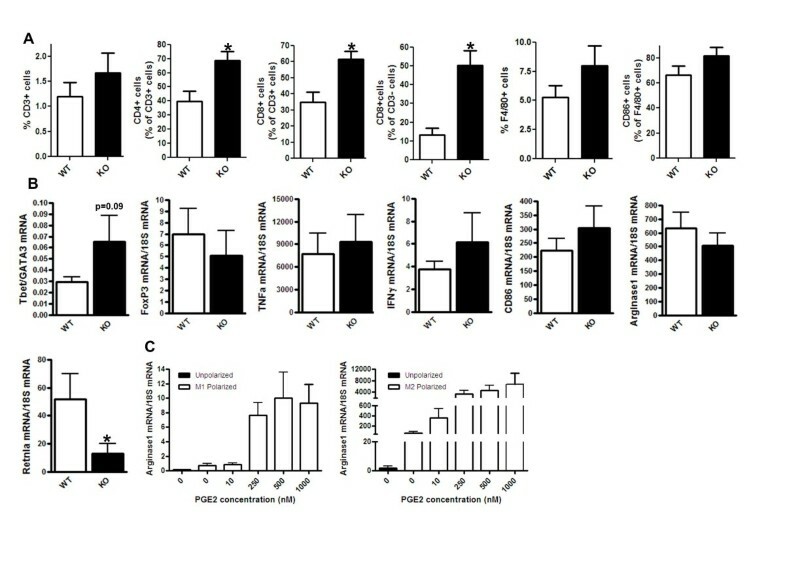 PD-L1 was alsodecreased in IFNγ-treated COX-2KD mouse mammary cancer cells in vitro and, compared to control cells, growth of COX-2KD cells as orthotopic tumorsin immune competent mice was markedly suppressed. However, robust growth ofCOX-2KD tumor cells was evident when recipients were depleted of CD8+ cells. 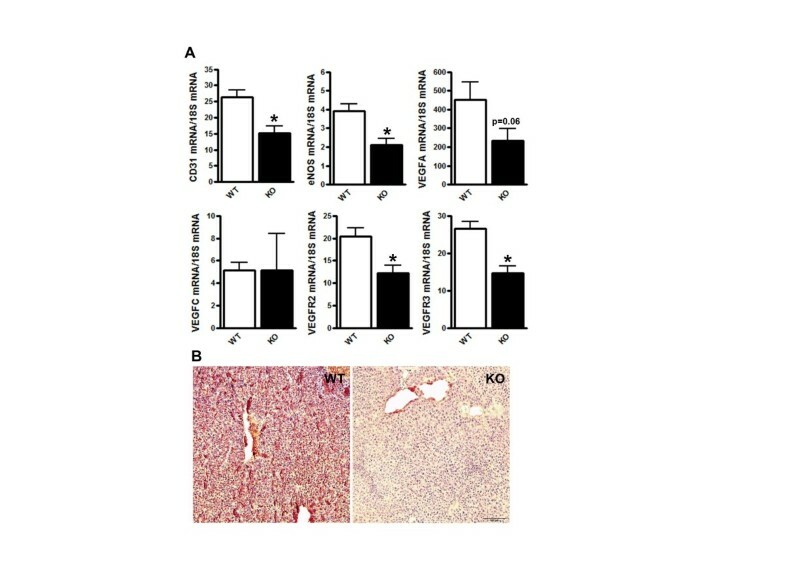 The data strongly support that, in addition to its angiogenic function, tumor cellCOX-2 suppresses intratumoral cytotoxic CD8+ immune cell function,possibly through upregulation of immune checkpoints, thereby contributing to tumorimmune escape. COX-2 inhibition may be clinically useful to augment breast cancerimmunotherapy. The inducible form of cyclooxygenase (COX), COX-2, and one of its pro-inflammatoryproducts, prostaglandin (PG) E2, are strongly implicated in a range of humancancers including breast cancer [1, 2]. Global deletion or pharmacological inhibition of COX-2 suppressedtumorigenesis in mice [3, 4] and humans . PGE2 signals through multiple pro-tumor pathways, includingPI3K/AKT, RAS-MAPK/ERK and Gs-axin-ß-catenin signaling, to increase tumor cellsurvival, inhibit apoptosis, increase cancer cell motility, stimulate angiogenesis andinhibit immune surveillance . In the last decade it has become clear that the tumor microenvironment is critical fortumors to survive and progress. In addition to vascular supply, the interplay of tumorcells with non-malignant cells in the stroma provides growth, survival and motilityadvantages. A central part of the tumor microenvironment is infiltration of immunecells, which can positively or negatively influence tumor progression depending on theirdifferentiation [7, 8]. Tumor rejection is favored through T helper 1 (Th1)-derivedcytokines that drive antigen-presenting and pro-immune M1 macrophage functions, and bythe direct tumoricidal actions of CD8+ cytotoxic T lymphocytes (CTLs) andnatural killer (NK) cells . However, as tumors progress, soluble mediators and cellular interactions arethought to reprogram immune cells to type 2 functions so that Th2lymphocyte-derived cytokines polarize macrophages to the M2 phenotype to suppress CTLs,promote angiogenesis and support tumor growth [6, 9]. In breast cancer, poor prognosis is associated with elevated Th2lymphocytes and tumor-associated macrophages (TAM), while Th1 lymphocytes,CTLs and NKs correlate with enhanced survival [8, 10], raising intense interest in therapeutic approaches to modify the tumorimmune microenvironment. COX-2-derived PGE2 has emerged as a tumor-derivedmediator that contributes to development of immune tolerance [11–13]. Several studies report the association of tumor COX-2 with infiltrating Tcells, dendritic cells, myeloid derived suppressor cells and macrophages [14–17], while PGE2 has been linked to immune suppression inhepatocellular carcinoma , lung , ovarian  and breast [14, 15] cancers. The mechanisms through which COX-2/PGE2 suppress immunefunction are poorly defined; however, PGE2 suppressed the ability of matureCTLs to kill murine plasmocytoma cells  and inhibited Th1 generation of interferon γ (IFNγ) [22, 23], a cytokine that is critical to sustain anti-tumor immune function [6, 24]. We reported that selective deletion of mammary epithelial cell (MEC) COX-2(COX-2MECKO) delayed carcinogen-induced mammary tumor onset coincidentwith enhanced markers of anti-tumor type 1 immunity . Chemical carcinogens are generally not, however, considered significant inhuman breast cancer etiology; therefore, in the current study, we investigated the roleof tumor cell COX-2-derived mediators in ErbB2 (HER-2/neu)-induced mammarytumorigenesis. ERBB2 gene amplification or overexpression of the HER-2 protein has beenidentified in 25% to 34% of human breast cancers [25, 26]. ErBb2 mouse models show remarkable morphological resemblance to some formsof human breast cancer and accurately recapitulate the hallmark changes associated withthe early stages of human breast cancer . 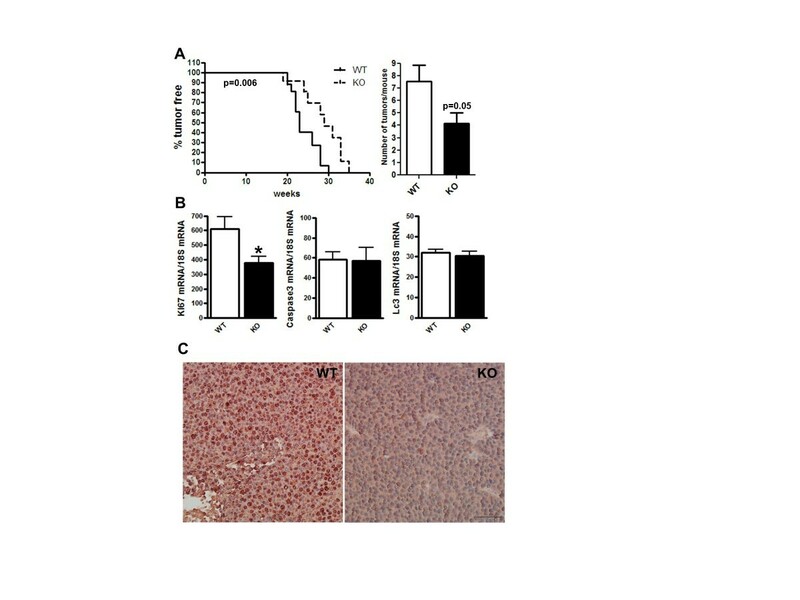 In COX-2MECKO mice transgenic for an activated ErbB2 mutant, wedetermined delayed tumor onset and reduced tumor multiplicity, as well as reduced tumorvascularization, compared to wild type (WT). Deletion of COX-2 in tumor cells alsosignificantly impaired maintenance of pro-tumorigenic lymphoid and myeloid cellfunctions thereby facilitating enhanced immune surveillance. All procedures were conducted in accordance with National Institutes of Healthregulations and were approved by the Institutional Animal Care and Use Committee ofthe University of Pennsylvania. Floxed COX-2 mice, generated by flanking the COX-2 gene between introns 5 and 8 withloxP sites (COX-2flox/flox), were backcrossed fully (>9 generations)onto an FVB background and are denoted as wild type (WT) mice. COX-2flox/flox mice were crossed with FVB mice expressing Cre-recombinase under control of themouse mammary tumor virus (mmtv) promoter (Cremmtv), which is used widelyto target transgene expression to MEC. The resulting mice were termedCOX-2MECKO and their characterization is described in our previous work . WT and COX-2MECKO were crossed with mice transgenic for theErbB2 (HER2/c-neu) oncogene carrying Eactivating Val664 to Glu664 mutation (Jackson Laboratory, Bar Harbor, ME, USA), also expressed under thecontrol of mmtv promoter. Genotype verification was performed by conventional PCRusing primers listed in Table 1. Mice were palpated weekly and considered tumor bearing if a palpable mammary masspersisted for more than one week. On necropsy, tumors were counted and isolated fromsurrounding tissues, after which they were either frozen and stored at -80°C forRNA extraction or fixed in Prefer (Anatech, Battle Creek, MI, USA) overnight andparaffin embedded or digested to obtain single cell suspension for flow cytometry andmicrobead separation. For tissue digestion, tumors were washed with (D)MEM/F12 + 5%fetal bovine serum (FBS) + gentamycin 50 mg/ml, minced and placed in digestion bufferconsisting of 9 parts of wash buffer +1 part collagenase/hyaluronidase (StemCellTechnologies, Vancouver, BC Canada). After two hours shaking at 37°C, thesuspensions were centrifuged at 1,000 rpm for five minutes. Pellets were washed andtreated with red cell lysis buffer (1 part HBSS+2%FBS + 3 parts NH4Cl) andthen with Trypsin-ethylenediaminetetraacetic acid (EDTA) 0.25% (Gibco, Grand Island,NY, USA), followed by Dispase and DNase (StemCell Technologies). Thereafter, cellpellets were passed through a 40 μm cell strainer, counted and re-suspendedeither in fluorescence-activated cell sorting (FACS) buffer for flow cytometry(description below) or in degassed MACS buffer (PBS + 0.5% BSA + 2 mM EDTA) forpositive selection of CD45+ cells using CD45-microbeads (Miltenyi Biotec,Auburn, CA, USA) according to the manufacturer's instructions. The NAF tumor cell line, which was generated from mammary tumors of ErbB2-transgenicmice, was kindly provided by Dr. Lewis Chodosh (University of Pennsylvania). NAF werecultured in (D)MEM medium containing 10% FBS, 1% L-glutamine and 1%penicillin/streptomycin. For viral transduction, 15,000 cells/well were plated on96-well plates. Mission plKO.1-puro Transduction Lentiviral Particles (20 μl),carrying either non-target control small hairpin RNA (shRNA) or COX-2 shRNA (Sigma,St. Louis, MO, USA), at 1 × 107 TU/ml were added to the wells with 8μg/ml protamine sulfate. After 18 hours, lentiviral particles were removed andcells kept in medium containing 2 μg/ml puromycin (Sigma) to select fortransduced cells. COX-2 knock down in COX-2 shRNA transduced NAF cells (NAF COX-2KD)compared to non-target shRNA transduced cells (NAF nt) was verified by Q-PCR. Cellswere serum starved for 24 hours and then treated with 10 ng/ml IFNγ(PeproTech,Rocky Hill, NJ, USA ), with or without 250 nM PGE2 (Cayman Chemicals, AnnArbor, MI, USA). Fresh IFNγ and PGE2 were added 24 hours later, andcells were harvested (0.25% Trypsin-EDTA) after 48 hour treatment, washed andre-suspended in FACS buffer for flow cytometry analysis. Bone marrow-derived macrophages (BMDM) were isolated as described . Femurs from female mice were flushed with (DMEM and cells pelleted (1,000rpm) and incubated at 37°C for 24 hours in (DMEM containing 10% FBS, 1%L-glutamine, and 1% penicillin/streptomycin. Non-adherent cells were collected andplated in L929 cell-conditioned medium (LCCM). To make LCCM, medium collected fromL929 cells (American Type Culture Collection, Manassas, VA, USA), that were split 1:5and grown to confluency, was mixed 1:5 with (DMEM with 10% FBS, 1% L-glutamine, and1% penicillin/streptomycin. Purity (approximately 99%) was verified by flow cytometryfor F4/80 and CD11b (not shown). BMDM were plated (0.5 × 106 cells/well) in LCCM. At 100% confluency, media was replaced with (DMEM. After24 hours, cells received vehicle, or M1 polarizing mix (100 ng/ml lipopolysaccharide(LPS; Sigma) and 20 ng/ml IFNγ (Peprotech)), or M2 polarizing mix (20 ng/mL IL-4and 10 ng/mL IL-13; Peprotech), with or without 250 nM PGE2 (CaymanChemicals). Supernatants were removed 18 hours later and cells lysed for RNAisolation. Total RNA from tumors and cells was isolated (RNeasy, Qiagen, Germantown, MD, USA),and reverse transcribed (TaqMan Reverse Transcriptase, Applied Biosystems, Carlsbad,CA, USA), according to the manufacturer's instructions. Real time quantitative(Q)-PCR of all genes, including 18S ribosomal RNA, was performed using inventoriedgene expression assays and TaqMan Universal PCR Master Mix from Applied Biosystems.PCR products were detected in ABI-PRISM 7900 sequence detection systems (AppliedBiosystems). Results were analyzed using the comparative Ct method, and normalized to18S RNA. Paraffin embedded tumor tissues were sectioned (4 μm). After de-paraffinizationand rehydration, endogenous peroxidase was blocked with 3% hydrogen peroxide. Heatinduced epitope retrieval was performed with 1 mM EDTA (Invitrogen, Grand Island, NY,USA). After overnight blocking at 4°C with 5% donkey serum (Sigma) + 0.1% Triton100× (Sigma), sections were incubated with primary antibodies overnight at4°C as follows: anti-Ki67 (Abcam, Cambridge, MA, USA,1:50 dilution), anti-CD31(Abcam, 1:200 dilution) or anti-CXCL9 (Aviva Systems Biology, San Diego, CA, USA1:125 dilution). Thereafter, the Polink-2 HRP Plus AEC System forImmunohistochemistry (Golden Bridge International, Inc, Mukillteo, WA, USA) was used,according to the manufacturer's instructions. Slides were then counterstained withhematoxylin (Vector Laboratories, Burlingame, CA, USA), and mounted (Aqua-Mount;Lerner Laboratories, Pittsburgh, PA, USA). Images were taken with a Nikon EclipseE600 microscope using ACT-1 imaging program (Nikon Instruments Inc., Hicksville, NY,USA). Single cell suspensions from tumor digestions (above) were centrifuged, washed andre-suspended in FACS buffer (PBS + 2% FBS +1 mM EDTA + 0.01% sodium azide), 1 ×106 cell/100 μl/tube. After a five minute incubation with ratanti-mouse CD16/CD32 (Mouse BD Fc Block, BD Pharmingen, Franklin Lakes, NJ, USA), 1μg/ml of fluorescein isothiocyanate (FITC) conjugated anti-CD3, PE conjugatedanti-CD4, and AF647 conjugated anti-CD8a, or PE conjugated anti-F4/80 and AF647conjugated anti-CD86 antibodies (Invitrogen) were added. OneComp eBeads (eBioscience,San Diego, CA, USA) were incubated with anti-CD3 or anti-CD4 or anti-CD8a antibodiesto perform compensation for spectral overlap. NAF COX-2KD and NAF nt (1 ×106 cell/100 μl), were incubated with PE conjugated anti-PD-L1antibody (Biolegend, San Diego, CA USA). After a 30-minute incubation, cells werewashed and re-suspended in 500 μl FACS buffer. Unstained tumor cells and cellsincubated with isotype control rat anti-mouse antibody were used as negativecontrols. FACS analysis was performed on a BD FACSCalibur machine (BD Biosciences,San Jose, CA, USA). Data was analyzed using FlowJo Research Flow Cytometry AnalysisSoftware (TreeStar, Ashland, OR USA). NAF COX-2KD and NAF nt tumor cells were injected into the #4 and #9 mammary glands (1× 106 cells/gland in 100 μl Hanks Balanced Salt Solution) ofnormal WT female mice between 8 to 14 weeks of age. Orthotopic tumor volume wasdetermined weekly using standard caliper measurement. For CD8+ depletion experiments,mice were injected intraperitoneally with 200 μg of an anti-CD8 or isotypecontrol antibody (BioXCell, West Lebanon, NH, USA), four days and again two daysprior to injection of tumor cells, and then twice weekly for a further four weeks.Depletion of CD8+ cells was confirmed by flow cytometry of erythrocyte lysed wholeblood (ACK Lysing Buffer, Invitrogen), four days and again four weeks after tumorcell injections. Statistical analyses were performed using Prism (GraphPad Software, Inc., La Jolla,CA, USA). As appropriate, comparisons were made using logrank analysis, unpairedt-test (with Welch's correction when variances were significantly different byF-test), Mann Whitney test (when the data distribution was not normal), or, formultiple group comparisons, analysis of variance (ANOVA) followed by Bonferroni'smultiple comparison test. The current investigation was designed to study the role of MEC COX-2 in mammarytumor development, with the goal of elucidating whether and how targeted inhibitionof COX-2 in epithelial cells affects the disease. In our previous study we confirmedCOX-2 deletion in MEC isolated from COX-2MECKO mice by Q-PCR and Westernblotting, and loss of PGE2 generation by COX-2MECKO cells wasestablished by mass spectrometry . COX-2 expression and PGE2 production were unchanged inperipheral macrophages isolated from COX-2MECKO compared to WT confirmingthe selectivity of the deletion . In the current study, tumor onset was significantly delayed inCOX-2MECKO mice compared to their WT littermates (Figure 1A). On necropsy, COX-2MECKO mice had significantly fewertumors compared to WT (Figure 1A). Consistent with theseobservations, cell proliferation appeared higher in WT tumors, as indicated by higherlevels of mRNA for the proliferation marker Ki67 in WT compared toCOX-2MECKO tumors (Figure 1B). Markers forapoptosis (caspase3) and autophagy (Lc3) were not different between the two genotypes(Figure 1B). Abundant expression of Ki67 protein in WT, but notCOX-2MECKO, tumors was confirmed by immunohistochemistry (Figure 1C). Tumor onset, multiplicity and cell proliferation were suppressed inCOX-2 MEC KO tumors. COX-2MECKO tumors aredenoted as KO. (A) Percent of tumor free mice against weeks of age. Meantumor free time for COX-2MECKO mice was 29 weeks versus 23 weeks forWT (left graph, n = 13 to 19). The right graph shows tumormultiplicity as number of tumors per mice at necroscopy (n = 14 to18). (B) Gene expression levels of Ki67 (proliferation), Caspase3(apoptosis) and Lc3 (autophagy) in whole tumors by Q-PCR (n = 8 to18). (C) Immunohistochemistry staining for Ki67 (dark red-brown) insections of paraffin embedded WT and COX-2MECKO tumors (image shownis representative of n = 4). Cell nuclei are counterstained withhematoxylin. The bar on the KO panel indicates 20× magnification. Data incolumn graphs are mean ± sem. P values are compared to WT; *P < 0.05. COX, cyclooxygenase; KO, knock out; WT, wild type. Q-PCR analysis of tumors revealed lower expression levels of CD31, an endothelialmarker, endothelial (e) NOS, the angiogenic factor VEGFA and its receptor VEGFR2(Figure 2A), in COX-2MECKO compared to WT. Althoughno difference was observed in mRNA levels of the lymphangiogenic factor VEGFC, itsreceptor VEGFR3 was significantly lower in COX-2MECKO tumors (Figure 2A). Immunostaining for CD31 revealed a denser blood vesselnetwork in WT tumors, confirming suppressed angiogenesis in COX-2MECKOtumors (Figure 2B). 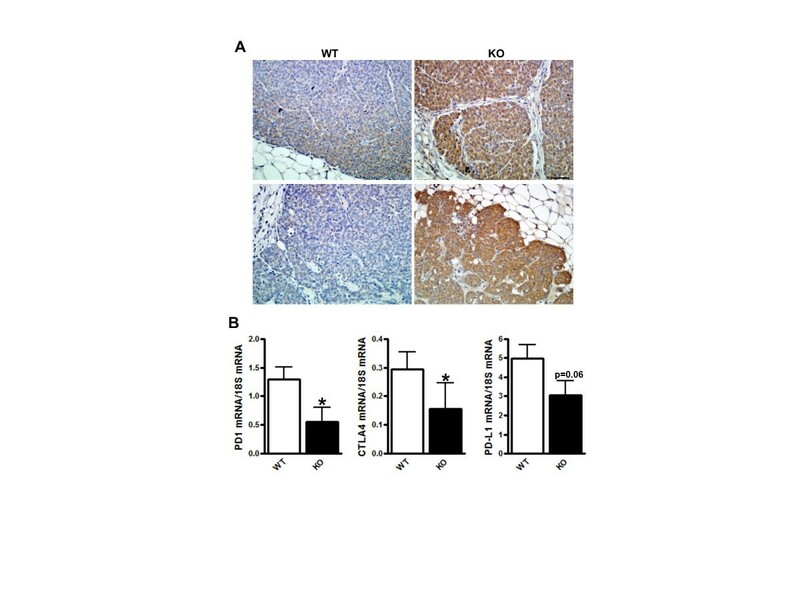 Angiogenesis was suppressed in COX-2 MEC KO tumors.COX-2MECKO tumors are denoted as KO. (A) Gene expressionlevels for CD31, eNOS, VEGFA, VEGFC, VEGFR2 and VEGFR3 in whole tumors byQ-PCR. Data are mean ± sem of n = 8 to 18. P values arecompared to WT. *P < 0.05. (B) Immunohistochemistry stainingfor CD31 (dark red-brown) in sections of paraffin embedded WT andCOX-2MECKO tumors (image is representative of n = 6).Cell nuclei are counterstained with hematoxylin. The bar on the KO panelindicates 20× magnification. COX, cyclooxygenase; KO, knock out; WT, wildtype. WT and COX-2MECKO tumors were analyzed by flow cytometry and Q-PCR tocompare the populations of infiltrating immune cells and their phenotypes. By flowcytometry, there was no difference in the total number of F4/80+ TAMsbetween WT and COX-2MECKO tumors (Figure 3A).COX-2MECKO tumors did, however, have significantly higher numbers ofCD3+CD4+ cells, a population that includes Th1,Th2, and regulatory T (Treg) cells, as well asCD3+CD8+ CTLs and CD3-CD8+ cells,encompassing NK and dendritic cells (Figure 3A). To furtherdefine their functional identify, tumor-infiltrating leukocytes (TILs) were isolatedusing magnetic microbeads coated with a pan-leukocyte marker CD45 and cells analyzedby Q-PCR for phenotypic markers and cytokines (Figure 3B). Theratio of Tbet (Th1 marker)/GATA3 (Th2 marker) tended to behigher in COX-2MECKO tumors compared to WT (Figure 3B), suggesting a prevalence of CD3+CD4+ Th1 over Th2 lymphocytes, when MEC COX-2-derivedmediators are absent. Further, mRNA levels for either Tbet alone or the Tbet/GATA3ratio were significantly correlated with CD4 mRNA in COX-2MECKO, but notWT, tumors (data not shown). Gene expression of FoxP3, a marker for Treg,was not altered and there was no difference in mRNA for macrophage type 1 cytokinesTNFα and IFNγ or an M1 macrophage marker CD86, in CD45+ TILs,suggesting no major change in M1 polarization in this disease model. COX-2-derivedPGE2 has been implicated in driving the immune suppressive phenotypetypically associated with TAM . Indeed, exogenous PGE2 treatment significantly increased theexpression of M2 marker Arginase 1, a key enzyme in suppression of T cell function,in both M1 and M2 polarized bone-marrow derived macrophages (Figure 3C). 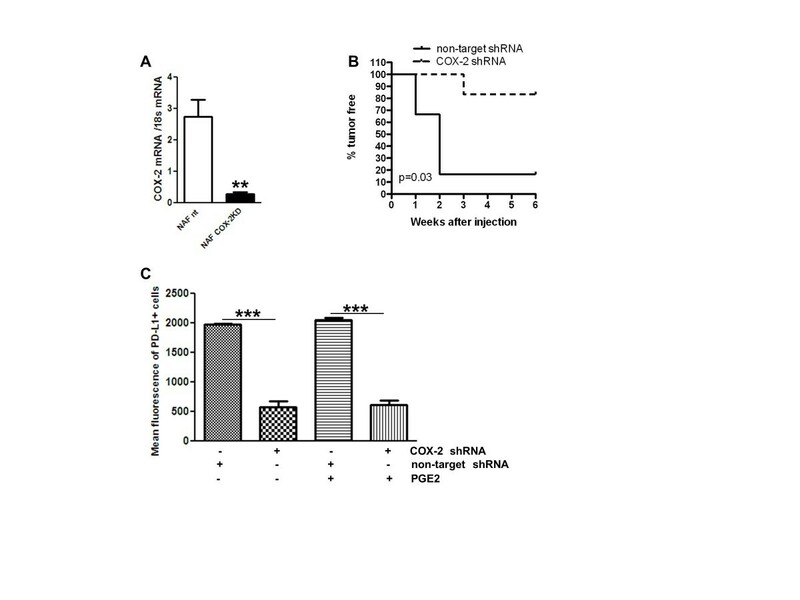 In tumors, although arginase 1 mRNA levels were similar in TILs fromCOX-2MECKO and WT tumors, another M2 marker, Retnla, was significantlydecreased in COX-2MECKO (Figure 3B). Taken as awhole, our flow cytometry, immune staining and CD45+ cell expressionanalysis indicates that absence of epithelial COX-2-derived mediators augmentsTh1 and cytotoxic immune function and reduces immune suppressivemacrophage function in the mammary tumor microenvironment. Deletion of mammary epithelial COX-2 modified tumor infiltrating cellphenotype. COX-2MECKO tumors are denoted as KO. (A) Flow cytometry analysis of tumor associated lymphocytes and macrophages(n = 7 to 10). (B) Gene expression levels measured by Q-PCRin CD45+ tumor infiltrating leukocytes (TILs) isolated from wholetumors by microbead separation (n = 6 to 7). (C) Geneexpression levels measured by Q-PCR in unpolarized, M1 polarized or M2polarized bone marrow derived macrophages, treated without or with PGE2 (n = 8). Data are mean ± sem. P values arecompared to WT; *p < 0.05. COX, cyclooxygenase; KO, knock out;PGE2, prostaglandin E2; WT, wild type. Our data thus far indicates a significant contribution of mammary epithelialCOX-2-derived mediators to pro-tumor immune function, particularly T lymphocyte andcytotoxic immune cell function, in the tumor microenvironment. We next examinedpathways that control T cell recruitment, activation and function. In breast cancer,tumor cell expression of the chemokines CXCL9 and 10 recruits lymphocytes, improvessurvival in mouse models and human studies [29, 30], and PGE2 inhibits expression of both chemokines in breastcancer cells in vitro . Paraffin embedded sections of WT and COX-2MECKO tumors showedsubstantially higher levels of CXCL9 expression, by immunohistochemistry, inCOX-2MECKO tumors, and this staining was evident throughout the tumorcells (Figure 4A). WT tumors, in contrast, showed weak CXCL9staining (Figure 4A). T cell activation requires binding of Tcell receptors to antigen and is regulated by a balance of co-stimulatory andco-inhibitory receptor-ligand interactions. T cell CD28 receptor engagement by CD80or CD86, expressed on antigen presenting cells, provides the additional signalnecessary for T cell activation. The same ligands can, alternatively, drive T cellsto a state of anergy through binding to cytotoxic T lymphocyte antigen 4 (CTLA-4) . Inhibition of T cell function is also directed through binding ofprogrammed death ligand 1 (PD-L1) to its receptor, PD-1, expressed on the T cellsurface . In our study, gene expression levels for both inhibitory receptors CTLA4and PD-1, as well as PD-L1, were decreased in COX-2MECKO tumors comparedto WT, suggesting suppressed signaling through co-inhibitory pathways (Figure 4B). Both cancer cells and tumor infiltrating myeloid cells areconsidered as sources of PD-L1 expression in the tumor microenvironment [33, 34]. We did not observe any change in PD-L1 mRNA levels in CD45+ TILs from COX-2MECKO and WT tumors (data not shown), suggesting thattumor cell PD-L1 was suppressed by COX-2 deficiency. Indeed, NAF COX-2KD, which,compared to NAF nt, grew poorly as orthotopic tumors in immune competent syngenicmice (Figure 5B) also produced substantially less PD-L1 proteinin response to IFNγ (Figure 5C). Interestingly, additionof exogenous PGE2 neither modified PD-L1 expression in NAF nt nor rescuedIFNγ-induced PD-L1 expression in NAF COX-2KD cells. 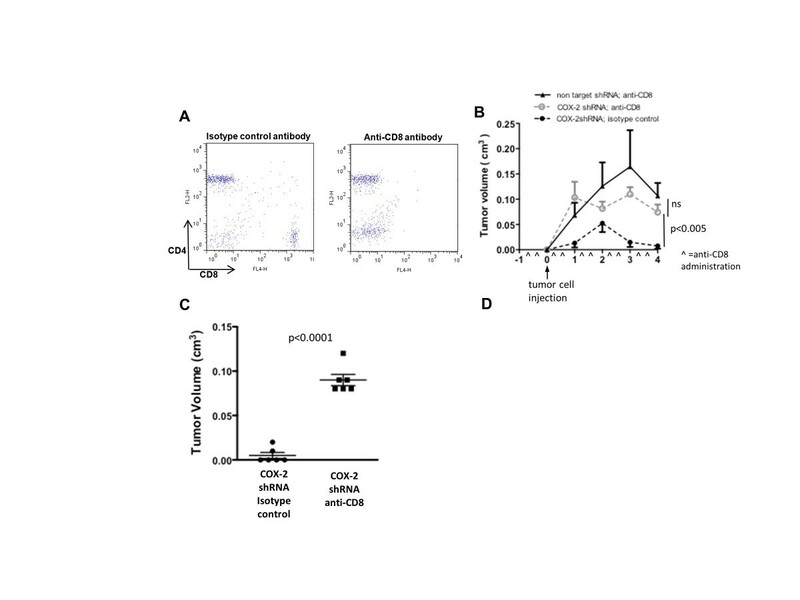 COX-2 suppresses immune surveillance by altering T cell recruitment andactivation. COX-2MECKO tumors are denoted as KO. (A) Immunohistochemistry staining for CXCL9 (brown) of sections from paraffinembedded WT and COX-2MECKO tumors (two images from each genotypeshown are representative of n = 4). Nuclei are counterstained withhematoxylin. The bar on the KO panel corresponds to 40× magnification. (B) Gene expression levels measured by Q-PCR in whole tumors (n = 8 to 18). Data are mean ± sem. P values are compared toWT; *P < 0.05. COX, cyclooxygenase; KO, knock out; WT, wildtype. COX-2 knock down reduced tumor cell PD-L1 expression and orthotopic tumorgrowth. ErbB2-transformed mammary epithelial cells (NAF) were transducedwith non-targeted shRNA (NAF nt) or COX-2 targeted shRNA (NAF COX-2KD). (A) COX-2 mRNA levels measured by Q-PCR, after 24 hours of treatment with 5μg/ml LPS (n = 4). (B) Percent of tumor free mice aftermammary fat pad injection of NAF nt and NAF COX-2KD (n = 6). (C) Mean fluorescence of PD-L1 in NAF, measured by flow cytometry, after 48hours of treatment with 10 ng/ml IFNγ, with or without 250 nM PGE2 (n = 3 to 6). Data in column graphs are mean ± sem.P values are compared to NAF nt control, unless otherwiseindicated. *P < 0.05, **P < 0.005, ***P <0.0005. COX, cyclooxygenase; KO, knock out; shRNA, short hairpin RNA. To assess how critical the loss of COX-2's immune suppressive actions was for reducedtumor growth and burden, we examined growth of NAF COX-2KD orthotopic tumors inrecipient mice treated with an anti-CD8 antibody, to deplete CD8+ immunecells, or an isotype control antibody. Complete depletion of CD8+ cells inblood was confirmed by flow cytometry (Figure 6A). In isotypecontrol antibody treated mice NAF COX-2KD grew poorly in only two of six injections.In contrast, six of six NAF COX-2KD tumors grew in CD8+ depleted mice,similar to NAF nt control cells (Figure 6B), and were markedlylarger at necroscopy (four weeks after tumor injection; Figure 6C). CD8 + cell depletion restores growth of injected NAF COX-2KD tumorcells as orthotopic tumors. (A) Flow cytometry of peripheral blood fromanti-CD8 or isotype control antibody treated mice four days after mammary fatpad injection (representative of n = 6). (B) Tumor growth of NAF ntand NAF COX-2KD cells injected into mammary fat pads of mice that receivedeither anti-CD8 or isotype control antibody injection (antibody treatmentdenoted with ^ along X axis; n = 6). (C) NAF COX-2KD tumor volumemeasured on necropsy of animals that were treated with either isotype controlor anti-CD8 antibody. In B and C data are mean ± sem of n = 6. **P < 0.005, ***P < 0.0005. COX, cyclooxygenase. Significant attention is now focused on understanding how resident and infiltratingcells in the tumor microenvironment support disease progression and in developingtherapeutic strategies directed at microenvironmental targets . Central to the pro-tumor microenvironment is suppression of immune cellfunction allowing tumor cells to avoid destruction. In the current study, wedemonstrated enhanced immune cell recruitment and reduced T cell co-inhibitory pathwaysin tumors that lack mammary epithelial expression of the pro-inflammatory enzyme COX-2,coincident with delayed ErbB2 oncogene-driven mammary tumor development. Consistent with established paradigms of COX-2 in cancer [6, 35, 36], deletion of MEC COX-2 delayed mammary tumor onset, lowered tumormultiplicity, reduced tumor cell proliferation and decreased tumor vascularization.Reduced vascularization in COX-2MECKO tumors was associated with lowerexpression of VEGFA and its receptor VEGFR2, a dominant pro-angiogenic pathway in tumors , consistent with the role of COX-2 in promoting the angiogenic switch thatallows tumors to progress . It may be that reduced tumor cell proliferation and suppressed angiogenesisassociated with deletion of MEC COX-2 was sufficient to suppress tumors. However, theelevation of CD4+ and CD8+ immune cell populations we observed inCOX-2MECKO mice, prompted us to consider how tumor cell COX-2 contributesto tumor immune function. COX-2-mediated promotion of pro-tumorigenic Th2 lymphocyte and M2 macrophagefunctional phenotypes, as well as suppression of cytotoxic immune cell activity, hasbeen reported . However, it remains unclear how COX-2 contributes to the orchestration ofimmune cell function as tumors develop. In part, the paucity of information reflects thedifficulties of working with global COX-2 knock out mice, which have breeding problems,severe renal pathology and a shortened life span , none of which are encountered in our targeted COX-2MECKO mice, aswell as the extensive use of immune deficient host mice for tumor transplant studies.Compared to WT, three populations of immune cells - CD3+CD4+,which are Th lymphocytes, CD3+CD8+ cells, which areCTLs and CD3-CD8+, which encompass NKs and dendritic cells - wereelevated in COX-2MECKO tumors. Within the CD3+CD4+ population, an increase in anti-tumorigenic Th1 cells may suppresstumors in COX-2MECKO mice; however, greater activity of Th2lymphocytes and/or Treg would be expected to promote tumor growth . The strong trend towards an increased T-bet/GATA3 mRNA ratio, a measure ofthe Th1 to Th2 balance , and the unchanged expression of FoxP3, a marker for Treg [6, 24], indicates the likely prevalence of the pro-immune helper function ofTh1 lymphocytes over pro-tumorigenic Th2 lymphocytes or immunesuppressive Tregs, in COX-2MECKO tumors. These data are consistentwith the shift toward type 1 immunity we reported previously in carcinogen-inducedmammary tumors in COX-2MECKO mice, which were also delayed compared to WT . Within the CD8+ populations, the suppressed tumor phenotype inCOX-2MECKO mice may result from increased cytolytic actions of CTLs andNKs , as well as enhanced immunogenic actions of mature dentritic cells . We did not directly discriminate between the relative contributions of theseCD8+ subtypes; however, a key role for CD8+ immune cells inCOX-2-mediated control of tumor immune function is strongly supported by the restorationof NAF COX-2KD tumor cell growth in CD8+-depleted mice. TAM are abundant in mammary tumors and their density is generally directly correlatedwith disease severity and prognosis [42, 43]. Similar to the Th1 and Th2 lymphocytecharacterization, M1 and M2 macrophages are considered anti- and pro- tumor,respectively . We reported previously that COX-2-derived PGE2 restrains M1macrophage polarization in vitro and in carcinogen-induced mammary tumors . In the current model, however, CD86, a M1 macrophage marker, was notdifferent in COX-2MECKO tumor associated F4/80+ cells(macrophages) or in isolated CD45+ TILs, compared to WT. It is likely thatthe relevance of COX-2-mediated paracrine control of M1 macrophage function to tumorprogression varies between models. Retnla (Resistin-like molecule alpha/FIZZ1), acytokine derived from alternatively activated M2 type macrophages , was significantly lower in CD45+ TILs from COX-2MECKOtumors suggesting reduced M2 polarization, a possible reflection of reducedTh2-derived cytokines in the COX-2MECKO microenvironment and/orloss of paracrine COX-2-derived PGE2 activity, which augments M2 polarizationof BMDM in vitro. As a whole, our analysis of the tumor microenvironment strongly supported a shifttowards enhanced helper and effector T lymphocyte recruitment and function inCOX-2MECKO tumors. It may be that there is simply an increased immune cellrecruitment to breast tumors lacking epithelial COX-2. Indeed, we saw a dramaticincrease in tumor cell expression of the T cell chemokine CXCL9 in COX-2MECKOtumors, consistent with a recent report in patients with invasive breast cancer thattumor cells are the major source of CXCL9 . In the same study, PGE2 suppressed IFNγ-induced CXCL9 levelsin MCF-7 and MDA-MB 231 breast cancer cells, and COX inhibitors increased CXCL9secretion. Despite the higher CXCL9 levels in COX-2MECKO tumors, however, theabsolute number of CD3+ cells by flow cytometry was not higher than in WTtumors suggesting a local influence of tumor cell COX-2 derived mediators in limitingimmune cell function rather than a simple recruitment effect. Intense interest in cancer immunotherapy has focused recently on immune checkpoints,whose function to dampen immune responses is important for self tolerance and control ofphysiological immune responses. Two central and well-studied immune checkpoints are theco-inhibitory receptors CTLA4 and PD-1; antagonists to both are currently in clinicaltrials for melanoma and other cancers . Engagement of CLTA4 or PD-1 on immune cells by their ligands CD80/CD86 orPD-L1, respectively, can suppress or shut down immune surveillance . Conversely, blockade of co-inhibitory receptor-ligand interaction canenhance anti-tumor immunity . In our study, levels of CTLA4 and PD-1, as well as PD-L1, were decreased inCOX-2MECKO tumors. The PD-1-PD-L1 interaction is of particular interest inthis regard since PD-1 expression in tissues is induced by inflammatory signals where itacts to suppress T cell activity and limit collateral tissue damage . We reasoned, therefore, that COX-2, an established inflammatory gene, mayact in tumors to upregulate expression of PD-1/PD-L1, thereby suppressing immunefunction and facilitating immune escape. In support of this hypothesis, NAF COX-2KD,which grew very poorly as orthotopic tumors, generated substantially less PD-L1 inresponse to IFNγ compared to NAF nt control cells. The failure of exogenousPGE2 to restore PD-L1 expression levels in NAF COX-2KD may suggestdistinct actions of autocrine and paracrine PGE2, or indicate a role forother COX-2-derived products, in tumor cell COX-2 mediated control of PD-1 expression.The pathways through which COX-2-derived PGE2/other prostanoids control tumorcell expression of PD-L1 and other immune modulators are currently underinvestigation. Our study provides significant insight into the complex autocrine and paracrinefunctions of mammary epithelial COX-2 in ErbB2-induced breast cancer and suggests thattumor cell COX-2 is an important component in establishing a permissive immunemicroenvironment. Recent studies indicated that CD8+ tumor infiltrationbolstered chemotherapeutic responses in human breast cancer and mouse models . Our demonstration that deletion of tumor cell COX-2 can enhancetumor-associated CD8+ cytotoxic immune cell infiltration and function mayopen new avenues to develop targeted strategies for COX-2 inhibition in combination withcytotoxic drugs. Further, there have been significant advances in cancer immunotherapyusing antibodies to block CTLA4 or PD-1 co-inhibitory function, thereby augmentinganti-tumor immunity [32, 47–49]. To our knowledge, our study is the first to link COX-2 to T cellco-inhibitory receptor/ligand function, a potentially new avenue to investigate COX-2inhibitors as adjuvants to immunotherapy. Finally, we demonstrated that interruption ofCOX-2 function selectively in epithelial cells was sufficient to reduce ErbB2- (thisstudy) and carcinogen  induced mammary tumorigenesis and growth. The clinical use of systemic COX-2inhibitors in cancer, although supported across multiple studies , is limited by the associated gastrointestinal and cardiovascular hazards . We speculate that, as improved targeted drug delivery modalities continue toemerge, delivery of COX-2 selective inhibitors directly to the tumor cells may allow forsafe and effective use of these drugs in cancer without the deleterious side effectsassociated with systemic COX inhibition. The data strongly support that, in addition to its angiogenic function, tumor cellCOX-2-derived mediators suppress anti-tumor immune cell function, possibly throughupregulation of inhibitory immune checkpoints, contributing to tumor immune escape.COX-2 inhibition may be clinically useful to augment breast cancer immunotherapy. NM made substantial contributions to the study design, data acquisition, analysis andinterpretation, as well as the writing and editing, of the manuscript. EPC contributedto data acquisition and analysis in the macrophage and flow cytometry experiments. RAEcontributed to the design of the immune depletion experiments. VN contributed to thedata acquisition. RHV contributed to the analysis and interpretation of the immunefunction data. EMS directed the conception and design of the study and the experimentalwork, contributed to the analysis and interpretation of data and critically revised themanuscript for important intellectual content. All authors read and approved the finalmanuscript.